You can order the book on Amazon.com, Barnes & Noble, or from IndieBound.org, including your local bookseller. 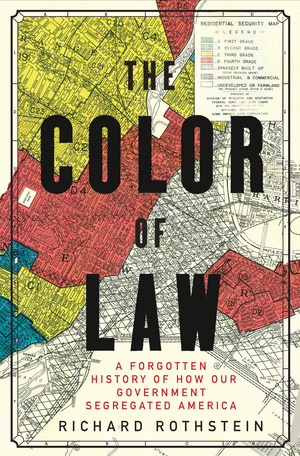 In The Color of Law (published by Liveright in May 2017), Richard Rothstein argues with exacting precision and fascinating insight how segregation in America—the incessant kind that continues to dog our major cities and has contributed to so much recent social strife—is the byproduct of explicit government policies at the local, state, and federal levels. The Color of Law was designated one of ten finalists on the National Book Awards’ long list for the best nonfiction book of 2017. To scholars and social critics, the racial segregation of our neighborhoods has long been viewed as a manifestation of unscrupulous real estate agents, unethical mortgage lenders, and exclusionary covenants working outside the law. This is what is commonly known as “de facto segregation,” practices that were the outcome of private activity, not law or explicit public policy. Yet, as Rothstein breaks down in case after case, private activity could not have imposed segregation without explicit government policies (de jure segregation) designed to ensure the separation of African Americans from whites. A former columnist for the New York Times and a research associate at the Economic Policy Institute, as well as a Fellow at the Thurgood Marshall Institute of the NAACP Legal Defense Fund, Rothstein has spent years documenting the evidence that government not merely ignored discriminatory practices in the residential sphere, but promoted them. The impact has been devastating for generations of African-Americans who were denied the right to live where they wanted to live, and raise and school their children where they could flourish most successfully. While the Fair Housing Act of 1968 provided modest enforcement to prevent future discrimination, it did nothing to reverse or undo a century’s worth of state-sanctioned violations of the Bill of Rights, particularly the Thirteenth Amendment which banned treating former slaves as second-class citizens. So the structural conditions established by 20th century federal policy endure to this day. At every step of the way, Rothstein demonstrates, the government and our courts upheld racist policies to maintain the separation of whites and blacks—leading to the powder keg that has defined Ferguson, Baltimore, Charleston, and Chicago. The Color of Law is not a tale of Red versus Blue states. It is sadly the story of America in all of its municipalities, large and small, liberal and reactionary.